CardioNet is the pioneer and current market leader for Mobile Cardiac Outpatient Telemetry. CardioNet has introduced several versions of the MCOT™ device most recently introducing a new device MCOTos which combines MOCT and wEvent into one device. 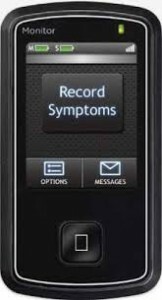 Easy user interface for patient’s to report symptoms. Proprietary ECG algorithm detects BPM, rhythm type, and waveform morphology.